Crossing the Line will allow the player tom shift between the world of dead and living. If you are a CryEngine fan then this will come as good news for you. Zomboko Entertainment are working on a new first person shooter titled ‘Crossing the Line’ that will be using the CryEngine. Zomboko will be bringing this game across the PlayStation 4, PC and Xbox One. In the game, the player needs to fight off against evil to bring the hero’s beloved back. Zomboko have released a statement regarding the announcement. “Though, you can’t do it at any moment, shifting will be availabe only after a certain sequence of player actions. But don’t overuse this ability – very frequent visits of the dead world could hurt the main character or even kill him. 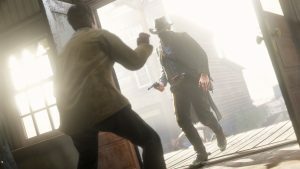 Initially, the visual style was intended to be depressive, dark but later, it was decided to make more cinematic and realistic everything around the player for deeper immersion into game world and its events,“ says Zomboko. The player will be able to shift between world of the living and the dead. Stay tuned for more news and updates as Zomboko will reveal new information.